Eloika Lake is located 7 miles north of Chattaroy off the Newport Highway in a wooded area, Eloika has one resort (Jerrys Landing Resort) with primitive launch (no power lines), RV & Tent sites, cabins, fishing boat & canoe rentals, etc. There is also a public boat launch (Grays Landing) with restrooms on E. Bridges Rd. The road to get to this public launch site has no visible public access sign, but when you get to the right road to turn on there is a blinking red light and Millers One Stop Store kitty corner to Gray's Landing; turn left (west on this road) here. This is a fine lake to boat on but is pretty weedy so is best suited for fishing. 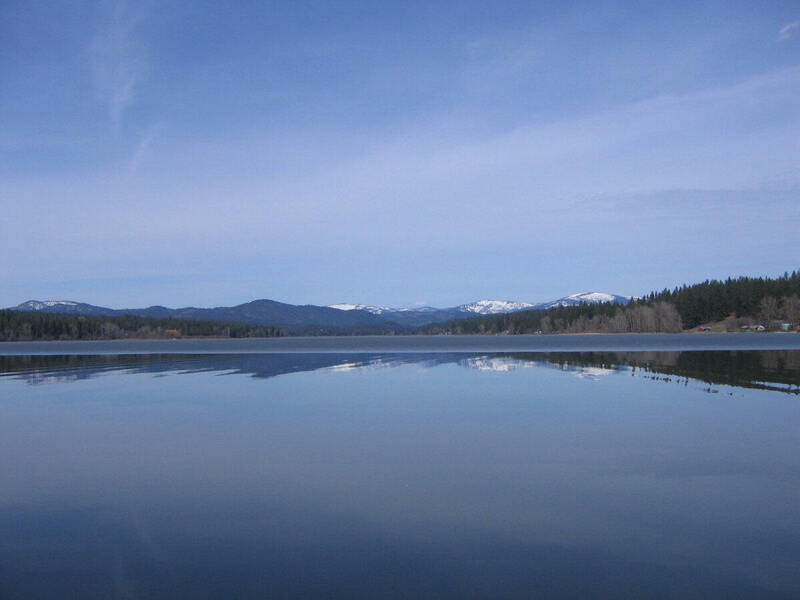 Sailing on this lake is possible via a shallow draft sailboat on toward the middle of the lake. There is a lot of weeds and lily pads around the edge of this lake so stay in the middle to avoid rudder(s) and motor intakes from being fouled up with weeds. Directions: From Spokane, go north on US 2, go 23 miles to Grays land Road, then west on E. Bridges Rd. 1 mile. To access Jerrys Landing Resort from Spokane travel North on Hwy 2 towards Newport 23 miles and follow signs - Call 509-292-2337 (the road to get to the resort is on W. Oregon Rd. 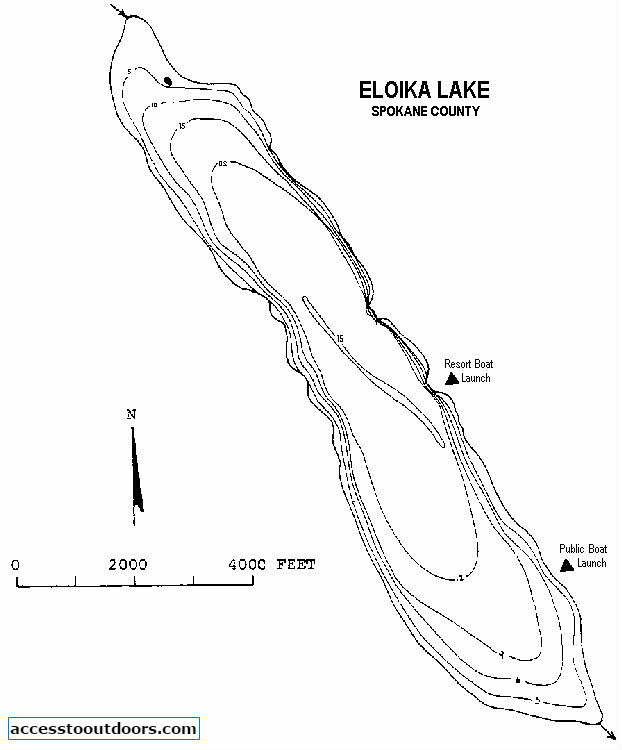 Maps: See printable lake map below. To view a map click on google.com/maps and type in Eloika Lake, WA. ACCESSIBILITY: PARKING... Gravel paved parking lot; PATHS/TRAILS... None; RESTROOMS/FACILITIES… One restroom but not ADA accessible; SENSORY... No sensory tactile markers for those with visual and other impairments. DOCKS/LAUNCHES/PLATFORMS… Two dock, one next to the one single lake gravel, dirt/mud boat launch, and the other is a small dock next to the shore line (not sure what its used for). Neither docks are ADA accessible; DIRECT WATER ACCESS… No access for wheeled mobility devices; TRANSFER SYSTEMS... None; CAMPING... Tent and RV campsites; O.T.H.E.R… Oddities/Barriers: Nothing unusual; Terrain: Level to about 5% grade at launch; H2O/Water: Water normally murky. Water temperature in the summer can be around 60 to 70 degree; Environmental Conditions: Nothing unusual; Resources: Some concessions at resort. Food, drinks, and gas along Newport Highway. ACCESSIBILITY: PARKING... Large gravel paved parking lot; PATHS/TRAILS... None. Mostly dirt gravel combo area going down to water, next to boat launch; RESTROOMS/FACILITIES… Restroom, not ADA accessible; SENSORY... No sensory tactile markers for those with visual and other impairments. DOCKS/LAUNCHES/PLATFORMS… One old dock, not ADA accessible. One single lake cement grated launch; DIRECT WATER ACCESS… No access for wheeled mobility devices; TRANSFER SYSTEMS... None; CAMPING... No; O.T.H.E.R… Oddities/Barriers: Nothing unusual; Terrain: Level to about 3% grade at launch; H2O/Water: Water normally murky. Water temperature in the summer can be around 60 to 70 degree; Environmental Conditions: Nothing unusual; Resources: Food, drinks, and gas available along Newport Highway.